Mickey Mouse is back with new adventures, a new look, and, in a surprise, a new voice. Mickey and the gang return to their short-film roots in the aptly titled Mickey Mouse, a new series from Walt Disney Television Animation premiering Friday, June 28, at 8:30 p.m. EST on Disney Channel. The 3.5-minute stories involve Mickey, Minnie, Goofy, Donald, and Daisy in escapades in exotic locales. The cartoons are fast-paced and stylized to be indicative of the vintage 1930s shorts that gave these superstars their start. A new short will debut each night this Friday, Saturday, and Sunday, followed by a regular premiere timeslot of Fridays starting July 5. The cartoons will first air on Disney Channel and will then be available for viewing in Disney.com’s recently expanded (and impressive) Disney Video webpage library. While the initial assumption would be to think Bret Iwan, Mickey’s official voice, is imitating Walt’s early Mickey voice to match the throwback nature of the series, that’s not the case. According to Disney animator Aliki T. Grafft, in the new shorts Mickey’s got a brand-new voice actor, Chris Diamantopoulos from Arrested Development and The Office. A visit to Diamantopoulos’s own Twitter profile shows that he indeed has been excitedly tweeting about Mickey since March and even confirmed the news this week. This comes as a huge surprise considering the effort Disney makes to preserve the continuity in its characters’ voices. For instance, Wayne Allwine voiced Mickey for nearly 30 years with no replacement. If Bret Iwan has only been Mickey’s voice since 2009, why is Disney already switching things up? Even more peculiar is that the rest of Mickey’s pals in these new cartoons retain their regular voice actors who have personified the characters for years: Russi Taylor as Minnie, Bill Farmer as Goofy, Tony Anselmo as Donald, and Tress MacNeille as Daisy. Mickey is portrayed in the new series as the plucky adventure-seeker from his early days who lives a bit wilder than the calm, reserved Mickey seen in recent years, so perhaps the change in personality prompted the change in voice. Whatever the reason, the voice shift to Diamantopoulos only seems to be for the Mickey Mouse shorts series. Bret Iwan is still considered to be the mouse’s official alter-ego. Iwan still voices Mickey in Mickey Mouse Clubhouse and made an appearance as recent as last week at an official, Disney-sponsored fan event at Disneyland. 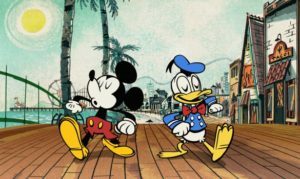 It’s important to note that Mickey Mouse is a completely separate project from Get a Horse!, the new black-and-white Mickey cartoon from Walt Disney Animation Studios that premiered early June at the Annecy Animation Festival.